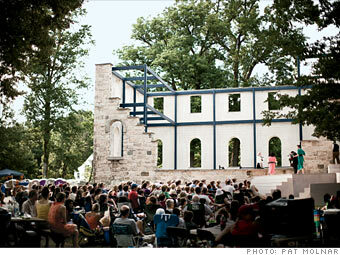 Hundreds flock to performances of the Chesapeake Shakespeare company at an open-air theater in Ellicott City. Ellicott City boasts grand homes, a lovely 18th-century downtown, and lots of restaurants. Columbia offers a wide range of housing, tons of parkland, and a major music venue. But those varied amenities are far from the only reasons this duo has risen to No. 2 from No. 8 in 2008. It's also an economic powerhouse with a jobless rate just as enviable as Eden Prairie's. Is Columbia a great town, or what?